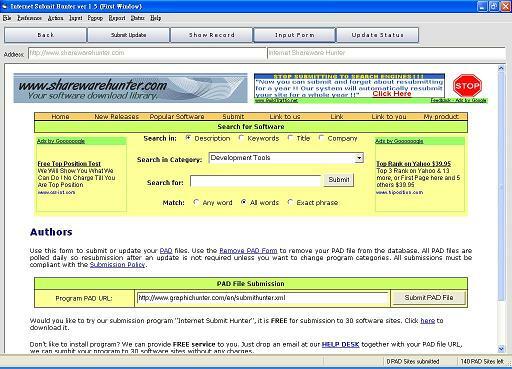 Internet Submit Hunter is a specially designed Internet Browser which will bring you to navigate and do program submission to over 500 software download sites. Although you can do this work manually with an Internet Browser, however, this is a very time consuming job which may need 2 to 3 weeks to finish program submission to 500+ software sites. With Internet Submit Hunter, you can cut down time to less than one day. For handling program submission, all software sites provide similar functions, such as "Submit New Application", "Submit Updated Application", "Registration for developer account", "Logon" functions etc. However, the location of the link to such functions and the wording for the link title has big difference among different software sites. For example, some website may put a link with name as "Program Submission" at the end of the home page, other website may requires you to logon to the website before you can find a link with name as "Submit new application". This is the reason why manual submission is so complicated. With Internet Submit Hunter's "Submit New" function, it will bring you to visit the software site and auto navigate to the submission page (no matter what link title and location of the submission page) and provide a one click input function for you to input the whole submission form by using one mouse click.